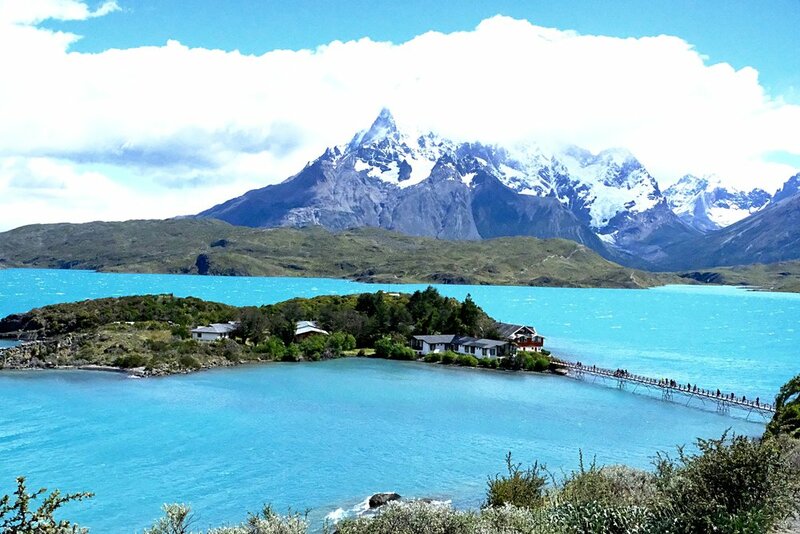 Warning: be prepared to be awe struck: the scenery of Chilean Patagonia is like no other. Located on the southern tip of the Chilean Andes, Patagonia is a land of epic wilderness--sparse and beautiful with inspiring glaciers, snow capped mountains and numerous fjords. The dramatic landscapes and multitude of outdoor activities have firmly planted it at the top of many outdoor enthusiasts bucket lists. This past December, after a few days in the Atacama Desert, my family spent four magical days at The Singular, exploring what is often referred to as the end of the world and one of the most beautiful places we had ever been. It's all about the gear--be sure to pack lots of layers, its not unusual to experience all four seasons in one day. For many of the hikes we'd start out in t-shirts and wind up in windbreakers, hats and gloves at the top, only to strip the layers on the way down. Most of the hotels are very informal, leave your dresses and ties at home. Pack comfortable, practical and casual clothing. If you are staying at the Singular, be sure to book the Chilean style BBQ dinner set in a private room located in the old blacksmiths shop. Comfortable hiking shoes and hiking socks are important. If you don't have a favorite pair, buy ones in advance so you have time to break them in. Read Trekking Torres del Paine: Chile's Premier National Park and Argentina's Los Glaciares National Park, this book details the Torres del Paine Circuit as well as shorter day walk excursions. The park is most crowded during December and January and while the weather is warmer it also tends to be quite windy. Late fall and early Spring bring cooler temperatures in the 60's with less wind and less crowds. Where to Go: Patagonia straddles both Chile and Argentina, with most agreeing if you only have time for one stop head to Chile. In addition to more luxurious hotel options, the Chilean side is home to the more spectacular scenery and the biggest draw: Torres del Paine National Park. The park attracts more than 100,000 visitors a year, there to visit the Paines Towers or Glacier Grey. Days are filled with glorious hikes, horseback riding, fishing, climbing and kayaking. Many people we met were combining their trip with the Argentinian side, just a four hour drive. Since Calafate in Argentina is more accessible, a three hour flight from Buenos Aires, it is also more touristy. Though we couldn't fit it in our schedule, we hear the Perito Moreno Glacier is worth the trip, and if you can carve out the time well worth traveling to. Who Should Go: This is an dream trip for everyone--solo travelers, couples, honeymooners and families. The long days of hiking equate to quality time spent together, leaving you eager to discuss all the details of your day while sharing drinks and laughs over dinner. Getting There: Now the bad news, getting to Chilean Patagonia is not so easy. You first fly overnight to Santiago, clear customs, then fly to Punta Arenas or Puerto Natales. Try to arrange your itinerary to fly into Puerto Natales (flights are available on Tuesdays and Saturdays) as then it's only a 10 minute drive to The Singular rather than a 2.5 hour drive from Punta Arenas. The other hotels are another few hours further from Punta Arenas making The Singular a good first stop for a day or two before venturing further in the park. Stay: There are several “luxury” lodging options in Patagonia. It's a hard choice between The Singular, Tierra, Awasi, Explora and Eco Camp as each hotel has its own character, location and personality. An ideal itinerary would be to stop first for a few days at The Singular, situated on Last Hope Sound and boasting numerous water based activities and fishing, before traveling further into the park. Built in a historical meat packing plant, the Singular with 57 rooms (large for Patagonia) is also known for its outstanding food, an added plus. Tierra, the most striking architecturally, is located on the edge of the park on a bluff overlooking Lake Sarmiento with gorgeous views from its floor to ceiling windows. Awasi with 14 rooms set in a private reserve overlooking the park is known for its private excursions. It's remote, romantic and peaceful; probably not the best choice for families looking for more action. Explora, with an ideal location right in the park (a 5 hour drive from Punta Arenas) is simple, comfortable and we hear slightly tired and in need of a facelift. But, the location is ideal and they are recognized for their expert guides and quality excursions with over 50 guided hikes and horseback rides. For a unique experience, also with a desired location right in the park, Eco Lodge has 25 tent-like geodesic domes (some with fireplaces) with larger domes for communal dining.With all different lodging options and price ranges, Eco Lodge attracts a wide range of people who gather together each day at meals, yoga and excursions, fostering a feeling of community during your stay. Our friend, just back, loved it and said it was the highlight of their two weeks in Chile and Argentina. Excursions: There are so many fantastic excursions that one can experience in Patagonia, but in a few days its not possible to do them all. When you check into your hotel, you will meet with the hotels specialist who will help plan your activities during your stay based on your groups's interest and fitness levels . Here are the ones we recommend, highlights of our stay at Singular and of our friends based at Tierra and Eco Camp. Hike to the Base Towers - Torres Del Paine, named after the three towers that protrude into the sky, is one of the most iconic Patagonia images. The hike to the base of the towers is certainly demanding, though extremely rewarding - ending at a turquoise glacial pool surrounded by the three towers. The 12 kilometer trail is a steady uphill climb with the final kilometer a real killer. Parts of the hike are incredibly windy so bring layers for the top. This is a full day trek, one where the vistas will stay with you forever. Fly Fishing - There is nothing like fly fishing in the bottle green waters of Patagonia. Have your hotel book this in advance as each fisherman will need a permit. Good for both experts and beginners, this is an opportunity to fish in remote lakes, rivers and streams amidst the most beautiful vistas. Boat ride through the Fjords (Only offered at The Singular) - Set sail through the Patagonian Fjords and have lunch at an authentic Patagonian Estancia. This popular excursion is weather dependent, if the wind is strong, the ride is cancelled. (Keep your fingers crossed for good weather.) Book as soon as you arrive as the spots get filled quickly. Visit an Estancia - Estancias, private ranches or large farms, are an integral part of South America. You can cantor your heart out or enjoy a beautiful lunch while learning about the chilean culture. Wild Horse Tracking (Offered at Eco Camp) -Expert trackers lead the way on beautiful trails with the aim of finding the herds of wild horses that roam Torres del Paine’s. This is a full day hike with amazing views. French Valley - We did not get a chance to experience this hike but heard that it is one of the most beautiful treks in the park. The terrain is steep and rocky with unmarked paths in certain areas. This is a demanding hike (many choose to spend the night in quaint Refugio Paine Grande) but provides unparalleled views of the Paine Massif as well as hanging glaciers and all six peaks. Relax: Take advantage of the spa and book a massage for when you get back from one of the longer hikes. You can also just soak in the heated pool after a day of exploration.You'll need it! Drink: The Chilean drink is the Pisco Sour, we had MANY on the trip.